In April 2001, I was offered the most interesting part-time job I’ve ever had. For $7.25 an hour I began working at my local airport, where I would don a United Airlines uniform and learn all the ins and outs of commercial aviation. This was outside of Bozeman, Montana, where I had recently moved for a Master’s program in English. My airport job paid the rent all spring and summer, as I covered many of my co-workers’ shifts; within a few months I could practically run the airport by myself. I remember the startled look on passengers’ faces when they’d see me boarding them at the upstairs departure gate after having just checked them in for their flight downstairs a half hour ago; and then they’d see me outside a few minutes later loading their baggage onto the plane, before finally hopping onto the diesel push-back Tug and sending them down the taxiway. It was a small airport, and the airline employees were trained to do every task. Starting in the fall of 2001, my other part-time job commenced: teaching freshman composition three mornings a week as part of my graduate work. This involved reading the essays of dutiful ranchers’ children and transplant trustafarians alike, with the former group having a more intuitive knack for descriptive prose. September 11 was my day off. On my days off, when I was off fly-fishing or hiking, I would find myself subconsciously tracking inbound flights and takeoffs, distant jet blasts and glints of silver in the sun. 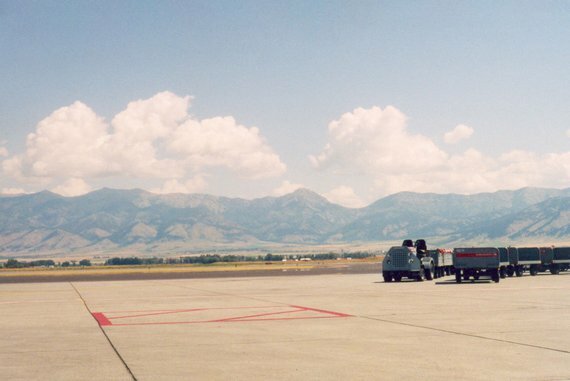 I remember the absence of planes that day as a kind of kink in the muscle memory that any job creates over time: where Delta’s 737 usually flew overhead from Salt Lake City at noon, there was only silence and sky. I was scheduled to work at the airport the following afternoon, on September 12. But first I had a class to teach. It was my first time teaching at the college level, and we were only a few weeks into the semester; I was 23 years old. I recall sitting in a discussion circle with 30 freshmen on that day, not really knowing what to say. When I tried, in my most affected professorial tone, to gingerly ask the class to consider the construction of the “we” in this claim, and whom exactly it was “we” should bomb, the same student screamed back at me, “ANYBODY!” His idea seemed to be that by inflicting firepower by air on other people, the United States could steal the show: the products of our military jets would be the focus of attention, and take away from the spectacle of four commercial airliners having gone rogue. And a spectacle it was. When I walked over to the student union after class for lunch, I saw that several large TV screens had been wheeled into the open spaces between the seating areas. Some students filtered in and out of the dining hall like normal, scooping out helpings of macaroni and cheese; other students stood transfixed, watching reruns of the planes crashing again and again and again into the towers of the World Trade Center. The event was being familiarly looped, and the ambience of the instant replay created a warm, somewhat stale sensation — despite the chillingly fresh content. That afternoon, I drove out to the airport for my shift. I had tried to call in to figure out if flights were on time, or if I even had to work — but the lines were all busy. I decided to play it safe and just show up. When I got to the airport, the scene was one of stunted pandemonium. The terminal seemed at once totally chaotic and oddly frozen. Yes, my manager explained, I was still needed for work; but there were no flights due in or out that day. However, they could start back up at any moment — so we had to be ready. In the meantime, there was a line of skittish passengers to deal with, people who were scheduled on flights that were not going to depart. These passengers didn’t realize, perhaps, the scope of what had occurred the day before, how all the commercial airlines had simply been grounded into the unforeseeable future. Not that we airline employees knew any better: the best we could do was reschedule the passengers on flights a day or a week later, send them off with newly printed itineraries, and cross our fingers. After assisting a dozen or so confused and distraught passengers who were feeling the logistical back-blow of what would come to be called 9/11, I went back into the break room and saw my manager Lance taping onto the wall a few photographs of himself directing a C-130 Air Force cargo plane onto our taxiway. This was one of the strange flights that had landed at our airport the day before; Lance had taken the roll of film to a one-hour photo lab that evening and had them printed out, and now was displaying them like little trophies. Lance told me excitedly that a Stealth bomber had landed in Bozeman, too; but it had refueled and taken off again before anyone could get a picture of it. We’ve been flying for nearly an hour, with nothing below us but the raw gorges and snow-covered peaks of the Hindu Kush. Somewhere down there are villages, fields, roads and trails, and the war we have returned to cover, but it’s all lost in distance, space and scale in the vastness that is Afghanistan. Schultheis goes on to describe the isolated town of Faizabad, including the friendly people he meets amid the wheat fields, pastures, and poppy fields. I took this essay to campus the following day and photocopied it for my students; in class, we took turns reading it aloud, slowly, paragraph by paragraph. We talked about the expository strategies that the author employed, including the initial focalizing mechanism of an aerial view; we also talked about the real people depicted in the essay, people caught up a long history of conflicts and power struggles in this place freshly glossed in the news, Afghanistan. Over the next several days I kept arriving at the airport to work only to face passengers who felt immobilized, and who were becoming increasingly frustrated that air travel had not started up again. As airline employees, we were not trained to explain the conditions and contingencies of a national state of emergency — instead, we would concentrate in front of our computer monitors, fingers clicking away, and rebook the passengers on theoretical future flights, exuding less confidence by the day in the following day’s departures. Still, it was our job, and so we carefully rescheduled passengers using a booking system that increasingly felt like dabbling in postmodern fiction: we were creating complex itineraries that would never be. Some passengers came back to the airport day after day trying to fly out of Bozeman. Their travel clothes became rumpled looking, and they had less confidence on their faces every time they came through the sliding doors of the terminal. It became more of a travesty with each day: people showing up with full suitcases and long faces, only to trudge back to the long-term parking lot a couple minutes later, after we had turned them away. Yet sure enough, one day a full plane flew in from Denver, and air travel was back on. By the end of the semester I was teaching my students about narrative perspective, and we were discussing how things could be examined from multiple angles. My students read Mark Twain’s “Two Views of the Mississippi,” and we parsed his two takes on the riparian landscape: that of the Romantic river gazer, and that of the jaded riverboat worker. Now, it seemed as though there was a third perspective we needed to talk about, one that we had encountered in Schultheis’ essay: the view from above. For at this point the news was flooded with aerial reconnaissance images of Afghanistan, including the Tora Bora region that looked not so unlike our own Tobacco Root Mountains stretched out across on the western horizon. There were contrails over those peaks; and on the news we could see weirdly congruous imagery of peaks on the other side of the planet, rendered by other planes with different intentions. Like Twain’s philosophical quandary about getting to know the river, and thus losing a sense its innate beauty, our own romance with flight had become complicated. For myself, I could no longer treat the Gallatin Field airport as a simple workspace; I saw it enmeshed in politics and power, territory and populations. This was no mere “regional” airport — it was part of a fraught global matrix where all flights were strange flights, and travel was never an isolated endeavor. Christopher Schaberg is assistant professor of contemporary literature and theory at Loyola University New Orleans. His book The Textual Life of Airports is forthcoming from Continuum, and he has also written a two-sided memoir about flight with the poet Mark Yakich, Checking In / Checking Out. Schaberg & Yakich maintain a site devoted to air travel stories at http://airplanereading.org.